For All Ages - For Crossfit, functional fitness, boxing, MMA, intervals, circuits, hit conditioning training & fat loss. The LOCASO FITNESS Rope is for everyone: men, women, girls, boys. Perfectly weighted with smooth, fast efficient rotations at maximum rpm. Strong & Durable- The LOCASO FITNESS Rope is built to last and endure your toughest workouts. Strong and durable, yet flexible steel wire cable with protective plastic coasting doesn't bend or tangle. Highly recommended for functional training and boxing for this reason. Effective Cardio Exercise- Use this jumping rope to increase stamina and build agility for intense training. Add into your cross training routine or use after any workout to increase heart rate. Versatile - With the adjustable, tangle free 3m durable cable length, it can be used by most heights. 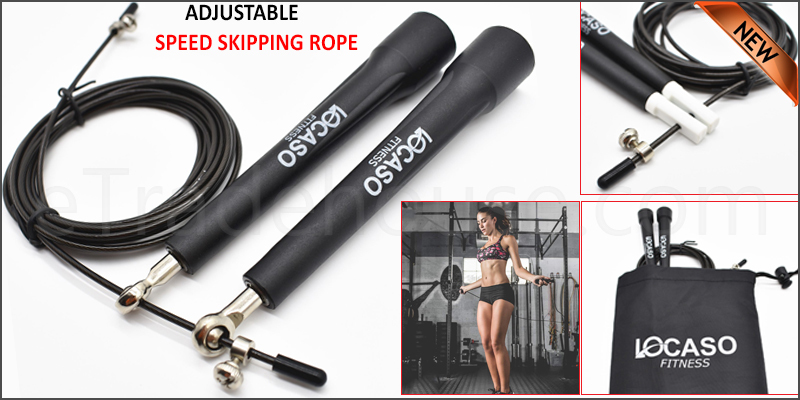 Whether you are a beginner or elite athlete this adjustable skipping rope is ideal for you. Lightning fast rotation - Steel ball-bearing mechanism ensures a smooth and effortless spin with maximum RPM. The thin handles allow for fine motor control and precision while turning the skipping ropes. It has a 360° handle and Steel ball-bearing mechanism for smooth, efficient rotations. Full Body Workout - Ideal for hard-core body conditioning for intense indoors or outdoors cardio workouts with skip rope exercises including double unders, twisters & Ali shuffles. Reach your performance potential and burn maximum calories. Adjustable Length - Using the length adjustment mechanism, the 3 m cable is easily adjusted to your height- even if you need an extra-long or short jump rope. Perfect for travel – Lightweight & comes in compact carry bag to fit in your gym bag or suitcase to use in the park, gym or hotel room. Perfect Addition to Home Gym: This lightning skip rope is the perfect addition to your home gym equipment. Exercise with this alone or create your own custom workout.